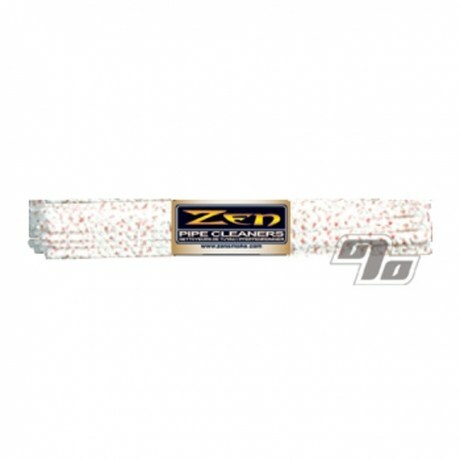 Bristle pipe cleaners from Zen really get into the dark and dirty places and get the gunk out. Bends and snakes around corners to get to the areas that pipe tools can't always reach with some bristled wire edges for digging deep and breaking up the resin. Now available in a big bundle of 48 pipe cleaners. Great value and super useful all around the pipes and the house. These pipe cleaners rock. Their bristles do a great job. A definitely good addition to our cleaning products. These are very soft with bristles. I'm sure they are best for glass, but I don't like them for my bat. I like a stiffer cleaner with bristles that gets it clean in one swipe. These bend very easily. Like I said, best for glass. These are rugged pipe cleaners, watch your hands holding them! Really do a wonderful job cleaning places that are long like pipe stems. They make regular pipe cleaners seem kind of silly to use! The bristles make the pipe cleaner. After using these Ill never use another brand. they get to the hard to reach spots in you bowls and the red bristles will grab all the goo with ease. If you have a decision to make, go with these. This is the best pipe cleaners I have ever found. Love them.